Now here is rarity! The Gibeon Meteorite fell in Namibia 3 million-years ago. It is so rare that itâ€™s export is now banned. The composition of 90% iron, 8% nickel, 0.4% cobalt, and 0.04% phosphorus made a natural â€œsteelâ€ for the ancients. Only Rick Eaton could divine this gift from the sky into a superb artifact of enchantment. 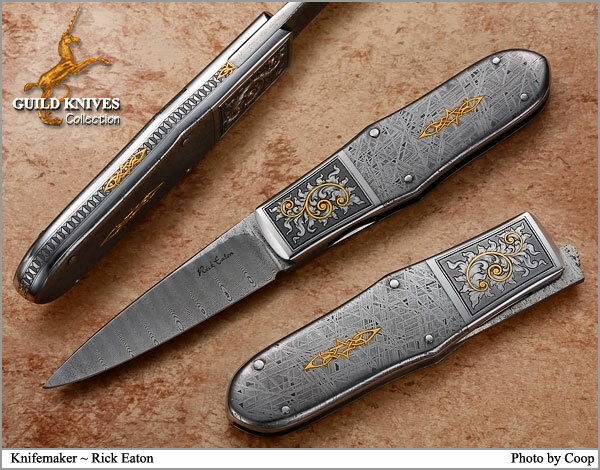 Rickâ€™s engraving and six-24K Gold inlays embellish this folder magnificently. Understated, low contrast Damascus blade by Robert Eggerling. Backspine delicately fileworked and 24K Gold inlayed. This is truly a singular knife. Warranty : By maker for his lifetime.